Ashburton Grove - Arsenal news and Arsenal opinion: Walcott: we can win the league - Wenger on borrowed time? 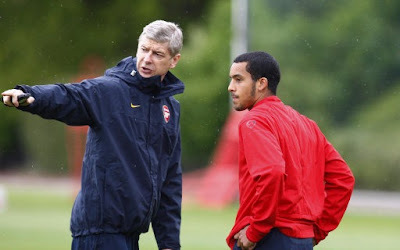 Walcott: we can win the league - Wenger on borrowed time? A very quick round-up as I have quite a busy day ahead. But first things first. Isn't it great to have the Arsenal back? The main news in terms of the team is that Robin van Persie passed his fitness test, Nicklas Bendtner is also fit but Aaron Ramsey has failed to recover from his calf injury. He should be back in time for next week's game with Blackpool. The manager said Manuel Almunia would start in goal and he was quite clear about that. Whilst he said that the spotlight would be on the Spaniard and he knew the second West Brom goal was his mistake, he also didn't beat around the bush when he declared that Almunia would start against Blackburn. It's unusual for the manager to give any member of the starting line up away the day before, but I'm sure he wanted to make sure Manuel knew his place was guaranteed.... for now. Theo Walcott has been talking about our chances and says we can win the title. "I think this year we've got that experience that any failures from the past won't happen again. "We need to win the Premier League. There is a confidence in the camp - and I believe we will be champions, I really do believe it. "I'm very confident, you've got to be. If you're not confident, then there's something wrong completely." It's great that he's got such confidence in us and it's also he's back in the team at this important stage of the season. I expect that he'll start this afternoon. And whilst the disappointments of losing the League Cup final and being knocked out of the Champions League might have led to a mental blow, we now have to use those experiences and make our game more robust. A solid team performance is what I'm looking for this afternoon. Even if we grind out a 1-0 win, I'll be happy. The manager said in his press conference yesterday that it is important that we build on our unbeaten league run with victories. Whilst March was a disappointment, we are still only five points behind Manchester United. It's vital we pick up points, no matter what the performance is like. Brian Woolnough in his Daily Star column suggests that the seven remaining weeks of the season could end with Arsene Wenger leaving Arsenal if he doesn't win a trophy. Interesting though, but not one I'd subscribe to. The manager was asked about Jack Wilshere's involvement in the Euro under-21 championship this summer. As expected he played the questions with a straight bat and said nothing to inflame the situation. Wilshere wants to play, Wenger knows that. Most Gooners would rather he had the summer off to fully recharge his batteries after his first full season in the Premier League. If picked he'll go to the tournament. There is nothing Arsenal can do. The manager will discuss the matter with Fabio Capello towards the back end of the season. There is no use talking about it now. Who knows what might happen in the remaining weeks of the campaign? A bit of transfer tittle-tattle? The Daily Mail say we're considering a move for Leighton Baines because of concerns that Gael Clichy won't renew his contract in the summer. I'll be back with a team preview a bit later and the official line up once it's announced.